How do you deal with change? I’m talking BIG CHANGE. Existential change in the way you do business. We are witnessing it being played out every week now in the drug sales world. CVS is buying Aetna Insurance, Express Scripts is combining with Cigna Insurance, and Wal-Mart is exploring a deal with Humana. These mergers are defensive moves because the health care delivery business is living in mortal fear of Amazon making a big move into the industry, which most people see as ripe low hanging fruit waiting to be plucked. Amazon, Berkshire Hathaway and Chase are combining efforts to develop an end run around traditional health insurance. Many people more connected than I am think the machining world, particularly high-volume turning aimed at the automotive industry, will soon face similar existential change. This view is based on the growth of electric vehicles, which use significantly fewer machined parts than internal combustion powered vehicles. Automotive suppliers as well as companies involved in the oil and gas products and distribution industry face a long-term dwindling demand for the stuff they provide. This will also affect the metals business, from mining to melting to rolling and trucking. The big shift to electric powered rechargeable cars and trucks will be more visible in five years because the Chinese seem to be committed to allowing only new electric cars to be sold in the country within a few years. 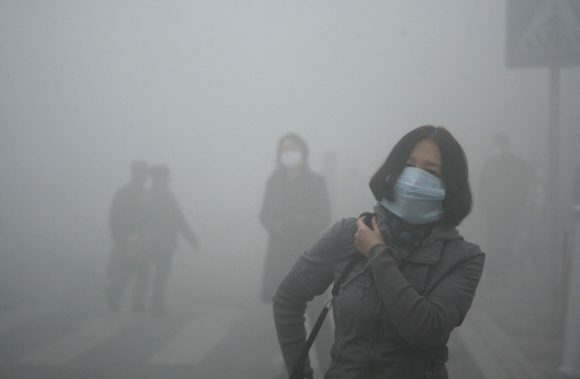 Smog in Harbin in northern China. China is a 13 million car market. The country’s leadership, almost out of self-preservation, realizes air pollution is an existential issue that cannot be pushed off indefinitely. The move to electric is a big step, and while it does not address China’s coal fired electricity plants, it will ameliorate air quality and show people that the government wants to make the country semi-livable. A billion Chinese folks wearing gas masks isn’t my primary worry. I am concerned that my traditional machining company clients will be choking as they compete for dwindling contracts for beautiful, accurate machined components that connect the petrol to the engines in the Chevys, Toyotas and Benzes across the world. What are some good options for folks (like me) who see very good business short-term by continuing to do what we are doing but are fearful about the longer term trend. • Diversify. Find a business where your skills translate but is unrelated to the internal combustion engine. Medical, firearms, plumbing, construction and military are some areas of interest. • Improve what you are doing now. Gasoline engines will be around for a long time even if new sales taper off, so prepare to get a bigger share of a smaller pie, especially the replacement market. • Redefine your narrative. If you define yourself as an automotive supplier or a screw machine house, change your mission to a broader one or a more specialized one. • If you are a company owner, fatten up your EBITDA and look for someone to buy your firm. Private equity companies are quite interested in machining companies these days. They like the cash flows and most of them are relatively short-term players. If you have a five-year window of growth in the machining world as related to oil and engines this is the time to fatten the cow. If you are not an owner go work for a firm which has made necessary changes. • As a wildcard countermeasure, invest in copper and cobalt stocks or futures. If electric really takes off, the price of copper and cobalt (lithium appears to be on the way out) will climb dramatically. The Chinese have been buying up copper and cobalt assets like crazy, especially in the Democratic Republic of Congo in Africa. If they hog the supply for internal use, the rest of the world will bid up the price for what is available. • Be on the lookout for the next big thing. It could be additive manufacturing, urban farming, exercise equipment, underground living, water purification, or a million other possibilities if you can change your personal narrative. Question: Do you think you will be driving in an electric vehicle in 10 years? 3D printing, artificial intelligence, and these new online exponential growth companies will change the whole world as we know it. Automation, robotics, big data, drones, electric cars and many changes in the management styles are going to rewrite how business operates in the next decade. I am for some sailing in the next decade for sure – for experience & leisure. We will adapt if we must, but why should we subsidize this change in so many ways? Level playing field with road taxes same as for gasoline power. Why give electric car makers the same advantage that Amazon got with no sales tax for so long? I have always wondered about the effects of going all-electric for passenger car vehicles in the United States, specifically the draw on the electric grid. Are there any engineers out there that can chime in with the amount of electrical energy needed to replace the gasoline energy currently being consumed? There is quite an energy punch contained in a gallon of gasoline which is easily transported. Would we have to expand with many more power generation stations whether it be coal, gas, nuclear, solar, wind, etc. ? I wont be driving an electrical vehicle in 10 years it will be driving it’s self. The problem today is everyone is going a different speed, making driving dangerous. I live in Phoenix and an electric vehicle is not practical for my wife and me, except possibly as an extra, non-essential vehicle like a motorcycle. We do a lot of inter-city travel and the cities are far apart – typically 125 miles minimum and California destinations are around 400 miles one way. An electric vehicle can be practical for me only if it has a range of 450 miles and can be charged in 15 minutes or less. Another comment about range – a manufacturer’s statement about vehicle range is under optimum conditions. In reality the batteries and cars will age with a degradation in performance, and also heat or cold degrades performance, too. In addition, one needs a range much greater than the point-to-point distance in case of road closures, detours, heavy traffic while running a/c, etc. In my opinion electric cars are only useful for regular, short commutes. Would you purchase that to be your only vehicle if you had to rent a conventional gasoline car every time you wanted to drive out of town? I don’t think electric cars will replace conventional gas cars until they have the same range as gas cars. I expect to be a passenger in an electric vehicle, probably driven by a human in 5 years, and by artificial intelligence in 10 years. I anticipate charging to be much more efficient by then with charging stations all over the place. The demise of diesel with the VW scandal and the environmental orthodoxy of European politicians will push Europeans to join the Chinese in pushing electric cars. I have driven in Teslas and enjoyed the experience. I think electric cars are coming in a big way. Hi Lloyd. I hope you’re right. But a vehicle with a range less than 300 miles is just not practical in the Western U.S. as a family’s only vehicle. By the way, I am 110% for self-driving/autopilot cars. I say bring it on as soon as possible and work out the bugs as we go. I want an electric car for the torque and acceleration. The range would become an issue about every weekend when we go somewhere 200 miles away and don’t have charger access. “As a second car used mostly for commuting” comes to mind. I am the guy who cant get the estimated 300 miles from a charge for sure. Until they all encounter some ice…..
Give me some loud pipes. Sticking to gas for now. I do not see electric in my future. With the rate of battery improvements it will take about 40 years to attract my attention. Absolutely ! We Love our Prius But When you need heat The, engine Kicks on. Look at how much wattage a hair dryer or toaster uses. Our winter mileage / range drops approximately 25%. Imagine the range limitations in winter in Chicago.